The Central Coast and France have a lot of things in common: amazing wine, artisanal food producers and—if you didn’t already know—a riveting bike race that takes the world’s top cyclists through breathtaking terrain. 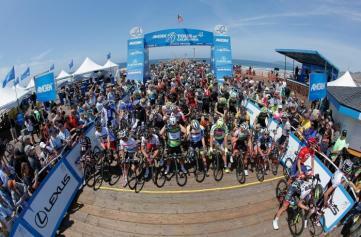 OK, so our Amgen Tour of California is a wee pit plus petite when compared to Le Tour de France. Still, there’s never been a better time to get inspired to hop on your own two wheels and pedal your way to foodie destinations found right on the Amgen Tour of California Stage 3 route: Pismo Beach to Morro Bay. Make sure to check those tires for air, bring your appetite, and get in on this Amgen adventure action. With any luck, this year’s National Bike Month will be the tastiest yet. Watch as Olympic medalists, Tour de France contenders, and World Champions zip by while taking in some sunny seaside vibes on Tuesday, May 16. The race action kicks off at 11:15 a.m. in Pismo Beach, where the aroma of clam chowder and the sound of crashing waves offer up a spectacular sendoff for participants of this 115-mile route. Opening festivities held by the city begin in Pismo Beach at 10:40 a.m., with an inaugural Surrey Race event with Wheel Fun Rentals at 11:15 a.m. Feeling competitive? Get your own team together and ride for your chance to win local gift certificates, gift baskets and hotel stays. Team entry fee is just $5, so the whole family can join in the play. Feeling more mellow? 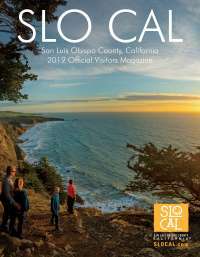 Cycle 26 miles of pristine Pacific coastline, visit the Monarch Butterfly Preserve or park your bike at Dinosaur Caves Park and enjoy the epic view. After all that physical exertion, you’ll be grateful to break for lunch at Splash Cafe, just steps from this quintessential beach town’s classic pier. World famous clam chowder served in a warm bread bowl is always an excellent choice, but there’s also an abundance of fresh salads, seafood, and sandwiches to choose from. Lido at Dolphin Bay offers up seaport-inspired cuisine prepared from fresh local farmland produce (oh, and did I mention there are several wine tasting rooms downtown, too?). After traveling hundreds of miles around craggy, foamy coasts and up steep, wild flower-adorned inclines, the Amgen Tour of California cyclists will bust through the finish line in Morro Bay. Catch the action on the Embarcadero around 3:45 p.m., then celebrate with a spin through this bike-friendly town, which features miles of paved scenic coastal roads that wind north around Estero Bay, south through Morro Bay State Park and estuary, and finally out to Montana de Oro State Park. Spin through the Embarcadero, hit the mountain biking trails or put wheels to sand with some chill beach cruising. There is nothing more relaxing than a leisurely dinner on the waterfront (and you earned your dinner today, my friend). Catch panoramic ocean views at 60 State Park Restaurant or Windows on the Water. As the sun sinks below famed Morro Rock, you’ll be treated to the fresh catch of the day, sustainably caught fish and chips, oysters, crab, and more. Afterward, take a stroll along this the laid-back thoroughfare and enjoy homemade salt water taffy, wineries, boutique shops and galleries. No matter where your team finished on the race, today you’ve truly won.